Two bedroom, Ocean Front Building!!!! ALSO AVALIBLE OCEANFRONT EFFICIENCY SLEEPS 6. See pricing below. Condominium is located on a 33-acre family-oriented establishment. My condominium is located on the third floor. Makes it easy to get up and down. Condominium feature two bedrooms, two full baths, a private balcony with an outstanding view of the Atlantic Ocean, sleeps six and comes fully-equipped ( DVD, coffee maker, blender, cable, dishwasher, central air conditioning, etc.). Beds: The master bedroom has a queen bed, the 2nd has two twins and the living room has a sleeper sofa. The condominium complex is situated oceanfront on a 33-acre private family resort located within five miles of an amusement parks, over 300 restaurants, shopping, entertainment, three fishing piers, and over 80 golf courses. We are approximately ten minutes from Myrtle Beach's best attraction area 'Broadway at the Beach'. Broadway at the Beach includes Hard Rock Cafe, Hollywood Wax Museum, Margaritaville, Ripley's Sea Aquarium, Planet Hollywood, IMAX 3D Theatre, Broadway SpeedPark, Myrtle Waves Water Park, the Ripken Experience-Myrtle Beach and numerous specialty shops, restaurancts and entertainment options. Myrtle Beach Resort is a self-contained 33-acre oceanfront paradise located four to five miles south of the pavilion in South Myrtle Beach. The resort amenities include six pools, both indoor and outdoor, volleyball, basketball, lighted tennis courts, sauna, jacuzzi, exercise facilities, arcades, and a playground. There is also a deli and short-order grill right on the resort. 1) A gate guard and 24-hour security at the entrance and constant 24-hour protection of the Resort Beach Area. 2) Tennis courts - lighted. 3) Six swimming pools - both indoor heated and outdoor pools. The oceanfront pool is 154 feet long, the largest anywhere on the Grand Strand. 4) Whirlpools with steam rooms, sauna rooms, and Universal weight and exercise machines. 5) Game rooms for the children with all the latest electronic games. 6) A 6000 square foot oceanfront cabana with food, beverage service, and a full service bar. In season, there is nightly entertainment (live band). 7) An enclosed indoor atrium - nothing like it on the Grand Strand!!! It is climate-controlled at all times, featuring an indoor heated pool, whirlpool, exercise machines, men’s and women’s locker rooms and showers, card room, game room, and glass elevators - all to be enjoyed in the year-round comfort of a protected environment, decorated with lush tropical vegetation. 8) There are also rooftop gardens for relaxation and panoramic views. 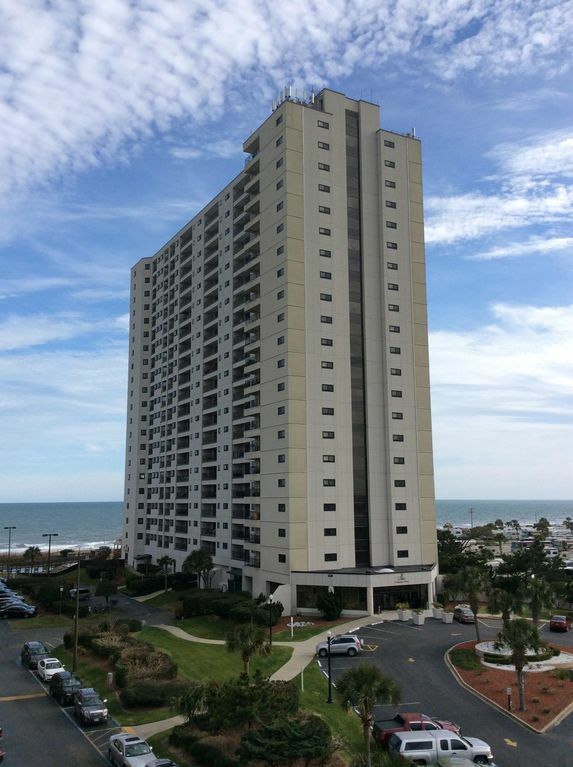 9) Also, part of the resort is the Renaissance Tower - a breathtaking high-rise, one of the highest in Myrtle Beach - 22 floors. It makes a luxurious statement as you drive up. Features include: A circular drive for unloading, convenience store downstairs for fast shopping, deli, and modern laundry facilities. There is also a spa with a large whirlpool, two saunas, showers, locker rooms, etc... All this overlooks our 6000 square foot oceanfront cabana, with live music playing in the summer. I Love the beach, and this location has everything. My kids stayed here and loved it and won't stay anywhere else. I feel safe because of the security and that we are in 32 acres and not on the strip. I feel that the tower is the best building at the resort because from all rooms, you have a view of the ocean. With my rooms, I give you everything to get started.